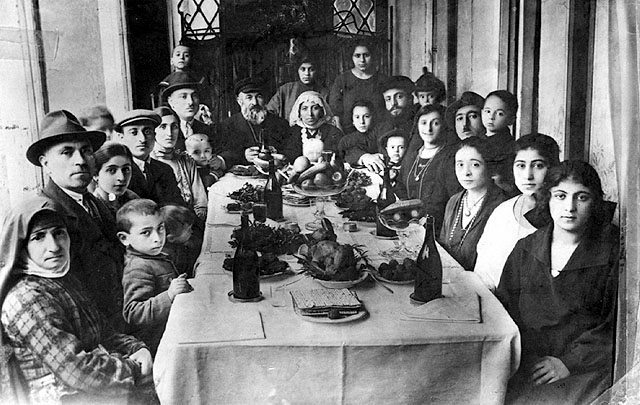 Seder of Pesah in Tbilissi, 1924. Beit Hatfutsot, The Oster Visual Documentation Center. Courtesy of Luba Danielov, Israel. Straddling Europe and Asia, Georgia, situated between the eastern shores of the Black Sea and the high mountains of the Caucasus, is a land of plenty, rich in exceptional nature and in historical heritage. Well preserved, it was praised by Pushkin, Alexander Dumas, or Lermontov. The Georgian nation, whose genesis goes back to the kingdom of Colchis, is evoked in the myths of the Golden Fleece and Prometheus. In the fourth century, it takes for religion Christianity, like neighboring Armenia. Federated in the eleventh century under the reign of King Bagrat III of Abkhazia, the kingdom of Georgia then enters a long period of instability as much related to the internal divisions as the pressures of the Byzantine and Mongolian, Arab, Persian and Ottoman neighbors and invaders. Annexed to Persia by the Russian Empire at the beginning of the nineteenth century, in the context of the advance of St Petersburg in the Caucasus, the Republic of Georgia will experience an ephemeral independence between 1918-1921, before being integrated to the Soviet Union, like the other two countries of the South Caucasus. Tbilisi regained its independence in 1990. After a particularly dark 1990s, notably marked by the civil war, Georgia has been engaged since the beginning of the 2000s in a dynamic of international openness and modernization, becoming one of the most welcoming country in the region. The history of Georgian Jews is at least as old as the history of Georgia itself. Their presence in the area echoes several biblical stories. According to the first, the Georgian Jews would be ancestors of the 10 lost tribes of Israel, exiled from Jerusalem to other areas of Assyria by King Salmanasar around the eighth century BC. According to the second version, they are descendants of the inhabitants of the kingdom of Judah, exiled by Nebuchadnezzar II after the capture of Jerusalem in 597. This version also explain why the Georgian Jews are called “guriyim”, which means lion cub in Hebrew, the emblem of the tribe of Judas. Finally, the region of the Caucasus, and in particular the territory of present-day Georgia, would also have welcomed Jewish populations exiled from Jerusalem after the second destruction of the Temple by the Romans in 70. Parallel to the biblical stories, the presence of Jews in the territory of present-day Georgia is mentioned in the first History of Armenia, written by Moise of Khorene around the fifth century of note era. According to the historian, several kings of Georgia and Armenia, including those from the Bagrat family, were of Jewish origin, would descend from King David. For their part, the Georgian Chronicles, written between the ninth and the fourteenth century, relate that the people of Georgia would already bring the people of Israel when Moses crossed the Red Sea. The Jewish neighborhood of Tbilissi, 1987, Beit Hatfutsot, The Oster Visual Documentation Center. Courtesy of Ottar Koveliani, Georgia. Developing over the centuries their own dialect, kivrouli, Georgian Jews are mainly engaged in agricultural activities, which explains in particular the presence of settlements throughout the territory, and not only in large urban centers. The history of Judaism in Georgia knows an important turning point in the early nineteenth century, when under the terms of the Golestan Treaty, signed in 1813 between St. Petersburg and Tehran, Georgia is integrated into the Russian Empire. Along with the Mizrahim Jews, indigenous, a number of Ashkenazi from other parts of the Russian Empire will gradually settle in Georgia: this region of the Russian Empire has about 20,000 Jews in the 1860s. This is why, even today, a distinction is made between the synagogues of Georgian rite and those of Ashkenazi rite. It is the rise of the Zionist movement in Russia that will allow, at the end of the nineteenth century, the development of contacts, hitherto limited, between the two communities. Georgia became part of the nascent Soviet Union in 1921, and like the rest of the USSR, Jewish citizens enjoyed a certain freedom of worship there until the turn of the 1930s, from which a major repression in the religious sphere is started. It should be noted that for a variety of reasons this repression was less noticeable in Georgia, where Jews were able to maintain a number of religious activities. On the whole less assimilated than most other Jews of the Soviet Union, the Georgian Jews will benefit in priority of authorizations to emigrate to Israel: their alyah begins in the early 1970s, after a group of Georgian Jews sent, in 1969, a request for assistance to the United Nations, which then had international repercussions. This emigration is particularly the subject of a cult scene of the Soviet film Georgian Mimino (1977), where the main character seeks to call in the Georgian city of Telavi, but is put, following a mistake by the operator, in relation with Tel Aviv. By chance, a Georgian Jew answers him. It follows a long dialogue interspersed with traditional Georgian songs between the two characters. This scene will remain for a long time the only evocation, on a comic note, of the emigration of the Soviet Jews in Israel. 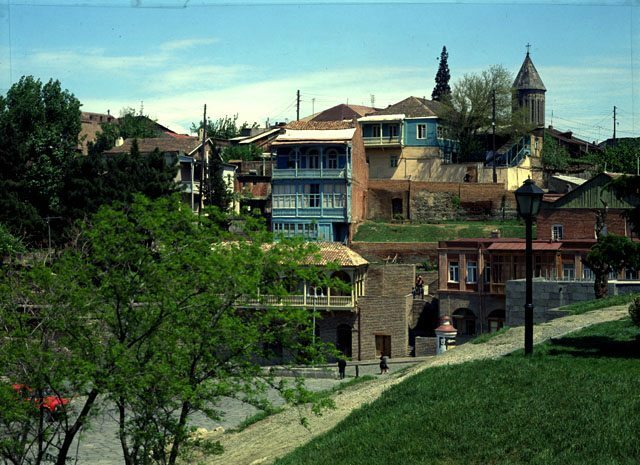 Today, the Jewish community in Georgia, which numbers about 5,000 people, is concentrated mainly in Tbilisi, Kutaisi, and Batumi on the shores of the Black Sea. Dynamic, this community also benefits from Georgia’s success with Israeli tourists, whose growing influx, about 60,000 per year, has contributed for several years to a real revival of local Jewish life.